I got very charged up when I saw the prompt for this week's Friday Fictioneers and thought I'd be positive rather than my usual negative about it. Yeah, I hate that sentence too. But I'll push it further: hope you get a charge out of the story below powered by the prompt above. If you don't, frankly I'll be shocked. Exiting the neighborhood hardware store with a large glass jar clasped under one arm, Ted ran into his friend Michael Farris in the parking lot. "Hey, Ted," said Michael, "I see you bought the new Eveready Bottle o' Batteries too." "Well, when you see how jammed full of all different types and sizes of batteries it is, how can you go wrong for a buck?" "Problem is it's a crap shoot, you can't really tell what you're getting." "Actually, Ted, it's worse than that." 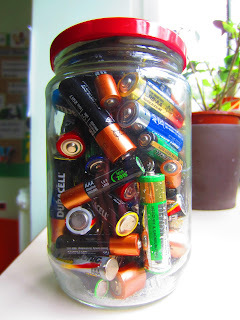 "The center of the jar doesn't contain any batteries at all!" "Oh, gee, what is it, full of cardboard?" "Nah. Hundreds and hundreds of wrapped Godiva chocolates." "Damn, ripped off again!" shouted Ted, dropping the jar to the parking surface below. Rip me off. Oh please rip me off. Godiva chocolates? Poor Michael, his contacts must be corroded. Glad to see you're ever-ready with a story, Perry. You wrote a AAA-1 piece this week. Well, I don't know about his contacts but mine have needed serious replacement since the 70's. Thanks, Rochelle, you're doing an AAA job as the new Prompt Master! I agree with Rochelle, rip me off. She is doing a great job. Nice idea for the prompt. Oh my! And Ted actually dropped the jar on the parking surface. What a pity. Wonderful story. That sounds like a bargain, Perry. Chocolates to go with? What could be better? That was a good laugh. Nice one! Chocolates.... Rip me off anytime! Nice job. Yes, the darkest most delicious chocolates to be found anywhere. But I'm afraid you won't find out when you get home because I already ate them off the parking lot surface! Well, when ya want batteries, ya want batteries! Thank you, Beth! Enjoyed yours as well. Thanks for the LOL, Boomie! If I find any additional chocolates lying around, maybe I'll call you. I'm grabbing for my heart! Oh, wait. That's been done already. Well, one man's bargain is another man's rip-off. Or something like that. Nah, I'll just shoot 'em at you with my slingshot. I was going to run to that parking lot and grab the Godiva chocolates but had second thoughts realizing my mouth may be full of glass and shards. Nice work. Well, Godiva chocolate isn't my favorite, but it IS chocolate. I'd say it was a good deal. Hijinx at the hometown hardware. My jar contained Waldo, of "Where's Waldo?" fame, the copper-top version of course. I was so angry, I could bite his head off, but that alkaline taste is hard to get rid of. seems worth a buck for sure. Hah! I loved how you stopped just before the inevitable smash of glass - no need to write it, we all saw and heard it clear enough. an eclectic, I mean electric take. Good one. I like Hershey's anyway! Reminds me of a time a street boy sold someone I know a flash disk for about 20% of the going price at the time. No, you don't, I want the batteries. You'll have to take each and every one of the chocolates, no argument! Don't worry. Remember they were each individually wrapped to withstand guys dropping the bottle in disgust. No, it's a lousy deal. You don't get anywhere near all the batteries promised. I smell class action suit! That's where he is after all these years! I never thought to look for him there. Yes, by all means, bite his head off, he's been annoying us all for far too long! Yes, I've been mature enough to avoid gratuitous violence in my writing ever since I was 57. Well, for you then, it's made of Hershey's. In keeping with the holiday season, it's a magical bottle o' batteries! I think there were a couple of flash drives in the bottle as well. Great story and more than up to your usual amperage.